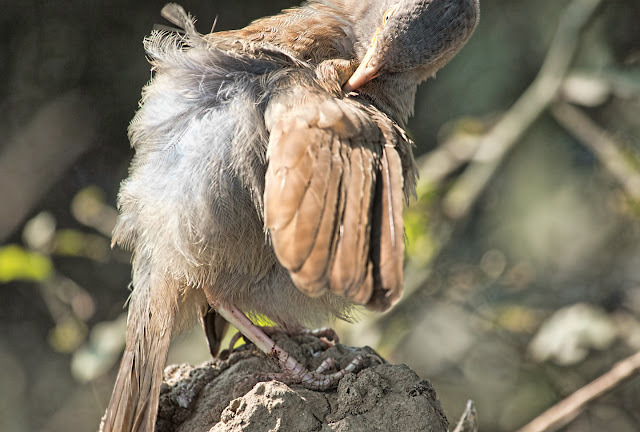 The bird is basically unrecognizable in this shot -- if I tell you that it's a jungle babbler from Keoladeo, you're just going to have to take my word for it. The Indians call these birds Seven Sisters, because they hang out in large, noisy groups, but somehow this is the only picture I got that isn't blurry. And the messiness of the picture very much reflects my life -- or at least, my apartment -- at the moment. After months of dithering and indecision, I finally took the plunge and bought a new bed frame and mattress last week. They were delivered Tuesday, so I took a day off, and spent most of the day hauling pieces of bed frame up the four flights of stairs to my apartment. The mattress was carried upstairs by a kindly (and well-tipped) delivery man, but the bed was deposited in my lobby and I had to deal with it myself. I could barely lift the cartons, much less carry them up stairs, so I unpacked everything in the lobby and carried the bed upstairs in stages -- first the headboard, then one side rail, then the other side rail, and so on. (O Suzo Where Art Thou?) It took me a total of six trips, and muscles I was barely aware that I possessed have been complaining ever since. Yesterday I took the old bed apart and assembled the new one. The instructions warned that it required two people, but I managed pretty well on my own, though it took me most of the afternoon. The unexpected bit of comedy involved the mattress. This is one of those newfangled memory foam versions that's shipped in a plastic-wrapped coil with all the air squeezed out. When you're ready to install, you lay the coil on the bed, cut the plastic and then unroll the mattress as it starts to inflate. You can probably guess where this is going. I was carrying some of the metal rods for the bed into the bedroom and must have grazed the plastic on the mattress. I heard a suspicious crinkling sound from the living room and walked back in time to see the mattress burst out of its encasings and start slowly, inexorably, to expand. It was like something from I Love Lucy -- I flung myself on top of the mattress and tried to persuade it to roll up again but found myself a few minutes later sprawled across an entirely inflated mattress which had draped itself across my coffee table and armchair. So I've accomplished enough for one weekend, I think. The good news is that I do love the new bed (you can see it here -- I'm too lazy to take pictures.) It's much better for a small bedroom than the wrought iron monstrosity it replaced, and the mattress is so comfortable I may just spend the rest of the day lying on it.